This reference topic for the IT professional describes how Windows authentication processes credentials. Windows credentials management is the process by which the operating system receives the credentials from the service or user and secures that information for future presentation to the authenticating target. In the case of a domain-joined computer, the authenticating target is the domain controller. The credentials used in authentication are digital documents that associate the user’s identity to some form of proof of authenticity, such as a certificate, a password, or a PIN. By default, Windows credentials are validated against the Security Accounts Manager (SAM) database on the local computer, or against Active Directory on a domain-joined computer, through the Winlogon service. Credentials are collected through user input on the logon user interface or programmatically via the application programming interface (API) to be presented to the authenticating target. Local security information is stored in the registry under HKEY_LOCAL_MACHINE\SECURITY. Stored information includes policy settings, default security values, and account information, such as cached logon credentials. A copy of the SAM database is also stored here, although it is write-protected. 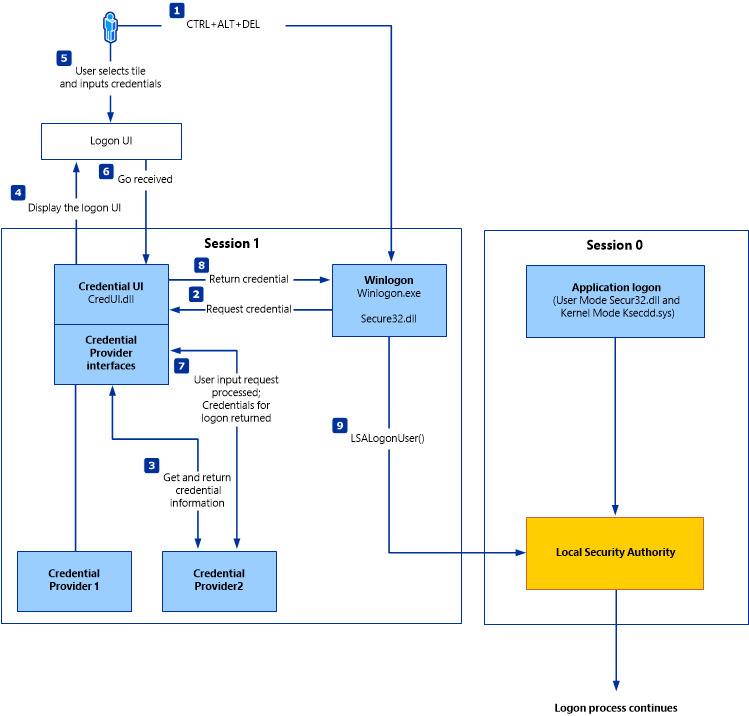 The following diagram shows the components that are required and the paths that credentials take through the system to authenticate the user or process for a successful logon. The following table describes each component that manages credentials in the authentication process at the point of logon. Winlogon.exe is the executable file responsible for managing secure user interactions. The Winlogon service initiates the logon process for Windows operating systems by passing the credentials collected by user action on the secure desktop (Logon UI) to the Local Security Authority (LSA) through Secur32.dll. Application or service logons that do not require interactive logon. Most processes initiated by the user run in user mode by using Secur32.dll whereas processes initiated at startup, such as services, run in kernel mode by using Ksecdd.sys. For more information about user mode and kernel mode, see Applications and User Mode or Services and Kernel Mode in this topic. The multiple authentication providers that form the foundation of the authentication process. The LSA Server service, which both enforces security policies and acts as the security package manager for the LSA. The LSA contains the Negotiate function, which selects either the NTLM or Kerberos protocol after determining which protocol is to be successful. A set of providers that can individually invoke one or more authentication protocols. The default set of providers can change with each version of the Windows operating system, and custom providers can be written. Maintains the computer’s secure channel (not to be confused with Schannel) to a domain controller. Passes the user’s credentials through a secure channel to the domain controller and returns the domain security identifiers (SIDs) and user rights for the user. Publishes service resource records in the Domain Name System (DNS) and uses DNS to resolve names to the Internet Protocol (IP) addresses of domain controllers. Implements the replication protocol based on remote procedure call (RPC) for synchronizing primary domain controllers (PDCs) and backup domain controllers (BDCs). The Security Accounts Manager (SAM), which stores local security accounts, enforces locally stored policies and supports APIs. The Registry contains a copy of the SAM database, local security policy settings, default security values, and account information that is only accessible to the system. In Windows Server 2008 and Windows Vista, the Graphical Identification and Authentication (GINA) architecture was replaced with a credential provider model, which made it possible to enumerate different logon types through the use of logon tiles. Both models are described below. The Graphical Identification and Authentication (GINA) architecture applies to the Windows Server 2003, Microsoft Windows 2000 Server, Windows XP, and Windows 2000 Professional operating systems. In these systems, every interactive logon session creates a separate instance of the Winlogon service. 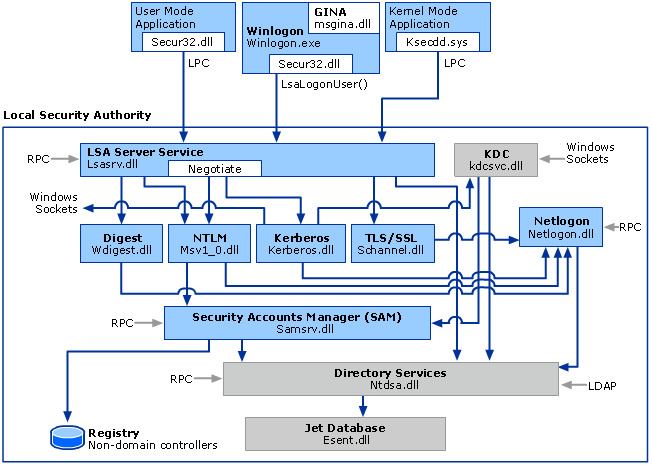 The GINA architecture is loaded into the process space used by Winlogon, receives and processes the credentials, and makes the calls to the authentication interfaces through LSALogonUser. The instances of Winlogon for an interactive logon run in Session 0. Session 0 hosts system services and other critical processes, including the Local Security Authority (LSA) process. The following diagram shows the credential process for Windows Server 2003, Microsoft Windows 2000 Server, Windows XP, and Microsoft Windows 2000 Professional. The credential provider architecture applies to those versions designated in the Applies To list at the beginning of this topic. In these systems, the credentials input architecture changed to an extensible design by using credential providers. These providers are represented by the different logon tiles on the secure desktop that permit any number of logon scenarios—different accounts for the same user and different authentication methods, such as password, smart card, and biometrics. With the credential provider architecture, Winlogon always starts Logon UI after it receives a secure attention sequence event. Logon UI queries each credential provider for the number of different credential types the provider is configured to enumerate. Credential providers have the option of specifying one of these tiles as the default. After all providers have enumerated their tiles, Logon UI displays them to the user. The user interacts with a tile to supply their credentials. Logon UI submits these credentials for authentication. Credential providers are not enforcement mechanisms. They are used to gather and serialize credentials. The Local Security Authority and authentication packages enforce security. Describing the credential information required for authentication. Handling communication and logic with external authentication authorities. Packaging credentials for interactive and network logon. Packaging credentials for interactive and network logon includes the process of serialization. By serializing credentials multiple logon tiles can be displayed on the logon UI. Therefore, your organization can control the logon display—such as users, target systems for logon, pre-logon access to the network and workstation lock/unlock policies—through the use of customized credential providers. Multiple credential providers can co-exist on the same computer. Single sign-on (SSO) providers can be developed as a standard credential provider or as a Pre-Logon-Access Provider. Each version of Windows contains one default credential provider and one default Pre-Logon-Access Provider (PLAP), also known as the SSO provider. The SSO provider permits users to make a connection to a network before logging on to the local computer. When this provider is implemented, the provider does not enumerate tiles on Logon UI. A user has the option of connecting to a network, such as connecting to a virtual private network (VPN), before logging on to the computer but is not required to make this connection. Network authentication is required to retrieve information used during interactive authentication on the local computer. Multiple network authentications are followed by one of the other scenarios. For example, a user authenticates to an Internet service provider (ISP), authenticates to a VPN, and then uses their user account credentials to log on locally. Cached credentials are disabled, and a Remote Access Services connection through VPN is required before local logon to authenticate the user. A domain user does not have a local account set up on a domain-joined computer and must establish a Remote Access Services connection through VPN connection before completing interactive logon. Network authentication and computer logon are handled by the same credential provider. In this scenario, the user is required to connect to the network before logging on to the computer. For those operating systems designated in the Applies to list at the beginning of this topic. The credential provider enumerates the tiles for workstation logon. The credential provider typically serializes credentials for authentication to the local security authority. This process displays tiles specific for each user and specific to each user's target systems. The logon and authentication architecture lets a user use tiles enumerated by the credential provider to unlock a workstation. Typically, the currently logged-on user is the default tile, but if more than one user is logged on, numerous tiles are displayed. The credential provider enumerates tiles in response to a user request to change their password or other private information, such as a PIN. Typically, the currently logged-on user is the default tile; however, if more than one user is logged on, numerous tiles are displayed. The credential provider enumerates tiles based on the serialized credentials to be used for authentication on remote computers. Credential UI does not use the same instance of the provider as the Logon UI, Unlock Workstation, or Change Password. Therefore, state information cannot be maintained in the provider between instances of Credential UI. This structure results in one tile for each remote computer logon, assuming the credentials have been correctly serialized. This scenario is also used in User Account Control (UAC), which can help prevent unauthorized changes to a computer by prompting the user for permission or an administrator password before permitting actions that could potentially affect the computer's operation or that could change settings that affect other users of the computer. The following diagram shows the credential process for the operating systems designated in the Applies To list at the beginning of this topic. Windows authentication is designed to manage credentials for applications or services that do not require user interaction. Applications in user mode are limited in terms of what system resources they have access to, while services can have unrestricted access to the system memory and external devices. System services and transport-level applications access an Security Support Provider (SSP) through the Security Support Provider Interface (SSPI) in Windows, which provides functions for enumerating the security packages available on a system, selecting a package, and using that package to obtain an authenticated connection. The application on the client side of the connection sends credentials to the server by using the SSPI function InitializeSecurityContext (General). The application on the server side of the connection responds with the SSPI function AcceptSecurityContext (General). The SSPI functions InitializeSecurityContext (General) and AcceptSecurityContext (General) are repeated until all the necessary authentication messages have been exchanged to either succeed or fail authentication. After the connection has been authenticated, the LSA on the server uses information from the client to build the security context, which contains an access token. The server can then call the SSPI function ImpersonateSecurityContext to attach the access token to an impersonation thread for the service. User mode in Windows is composed of two systems capable of passing I/O requests to the appropriate kernel-mode drivers: the environment system, which runs applications written for many different types of operating systems, and the integral system, which operates system-specific functions on behalf of the environment system. The integral system manages operating system−specific functions on behalf of the environment system and consists of a security system process (the LSA), a workstation service, and a server service. The security system process deals with security tokens, grants or denies permissions to access user accounts based on resource permissions, handles logon requests and initiates logon authentication, and determines which system resources the operating system needs to audit. Applications can run in user mode where the application can run as any principal, including in the security context of Local System (SYSTEM). Applications can also run in kernel mode where the application can run in the security context of Local System (SYSTEM). SSPI is available through the Secur32.dll module, which is an API used for obtaining integrated security services for authentication, message integrity, and message privacy. It provides an abstraction layer between application-level protocols and security protocols. Because different applications require different ways of identifying or authenticating users and different ways of encrypting data as it travels across a network, SSPI provides a way to access dynamic-link libraries (DLLs) that contain different authentication and cryptographic functions. These DLLs are called Security Support Providers (SSPs). Managed service accounts and virtual accounts were introduced in Windows Server 2008 R2 and Windows 7 to provide crucial applications, such as Microsoft SQL Server and Internet Information Services (IIS), with the isolation of their own domain accounts, while eliminating the need for an administrator to manually administer the service principal name (SPN) and credentials for these accounts. For more information about these features and their role in authentication, see Managed Service Accounts Documentation for Windows 7 and Windows Server 2008 R2 and Group Managed Service Accounts Overview. Even though most Windows applications run in the security context of the user who starts them, this is not true of services. Many Windows services, such as network and printing services, are started by the service controller when the user starts the computer. These services might run as Local Service or Local System and might continue to run after the last human user logs off. Services normally run in security contexts known as Local System (SYSTEM), Network Service, or Local Service. Windows Server 2008 R2 introduced services that run under a managed service account, which are domain principals. Before starting a service, the service controller logs on by using the account that is designated for the service, and then presents the service’s credentials for authentication by the LSA. The Windows service implements a programmatic interface that the service controller manager can use to control the service. A Windows service can be started automatically when the system is started or manually with a service control program. For example, when a Windows client computer joins a domain, the messenger service on the computer connects to a domain controller and opens a secure channel to it. To obtain an authenticated connection, the service must have credentials that the remote computer’s Local Security Authority (LSA) trusts. When communicating with other computers in the network, LSA uses the credentials for the local computer’s domain account, as do all other services running in the security context of the Local System and Network Service. Services on the local computer run as SYSTEM so credentials do not need to be presented to the LSA. The file Ksecdd.sys manages and encrypts these credentials and uses a local procedure call into the LSA. The file type is DRV (driver) and is known as the kernel-mode Security Support Provider (SSP) and, in those versions designated in the Applies To list at the beginning of this topic, is FIPS 140-2 Level 1-compliant. Kernel mode has full access to the hardware and system resources of the computer. The kernel mode stops user-mode services and applications from accessing critical areas of the operating system that they should not have access to. 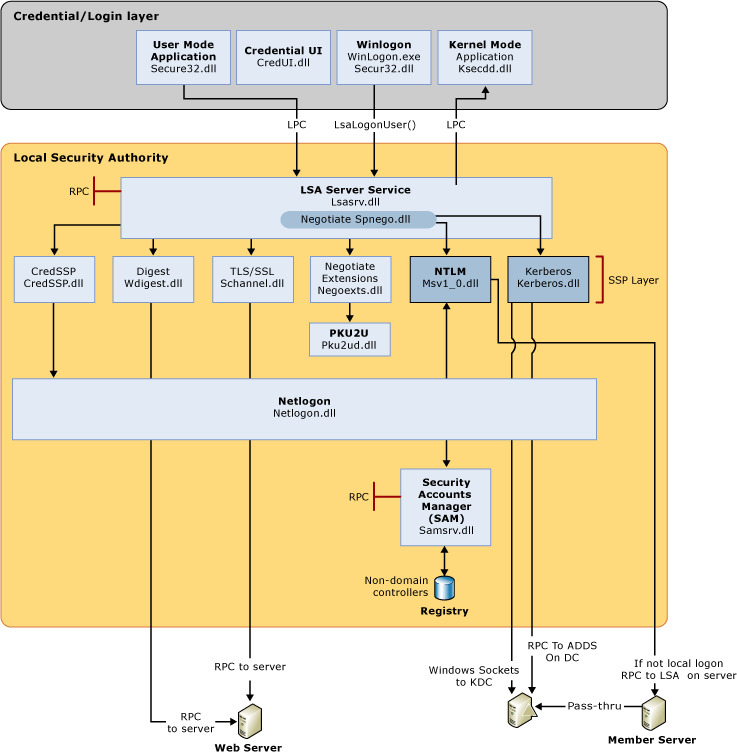 The Local Security Authority (LSA) is a protected system process that authenticates and logs users on to the local computer. In addition, LSA maintains information about all aspects of local security on a computer (these aspects are collectively known as the local security policy), and it provides various services for translation between names and security identifiers (SIDs). The security system process, Local Security Authority Server Service (LSASS), keeps track of the security policies and the accounts that are in effect on a computer system. Local Security Authority. The LSA can validate user information by checking the Security Accounts Manager (SAM) database located on the same computer. Any workstation or member server can store local user accounts and information about local groups. However, these accounts can be used for accessing only that workstation or computer. Security authority for the local domain or for a trusted domain. The LSA contacts the entity that issued the account and requests verification that the account is valid and that the request originated from the account holder. The Local Security Authority Subsystem Service (LSASS) stores credentials in memory on behalf of users with active Windows sessions. The stored credentials let users seamlessly access network resources, such as file shares, Exchange Server mailboxes, and SharePoint sites, without re-entering their credentials for each remote service. If the user logs on to Windows by using a smart card, LSASS does not store a plaintext password, but it stores the corresponding NT hash value for the account and the plaintext PIN for the smart card. If the account attribute is enabled for a smart card that is required for interactive logon, a random NT hash value is automatically generated for the account instead of the original password hash. The password hash that is automatically generated when the attribute is set does not change. If a user logs on to a Windows-based computer with a password that is compatible with LAN Manager (LM) hashes, this authenticator is present in memory. The storage of plaintext credentials in memory cannot be disabled, even if the credential providers that require them are disabled. For more information about how and where Windows stores credentials, see Cached and Stored Credentials Technical Overview. Introduced in Windows 8.1, the client operating system provides additional protection for the LSA to prevent reading memory and code injection by non-protected processes. This protection increases security for the credentials that the LSA stores and manages. For more information about these additional protections, see Configuring Additional LSA Protection. Validation mechanisms rely on the presentation of credentials at the time of logon. However, when the computer is disconnected from a domain controller, and the user is presenting domain credentials, Windows uses the process of cached credentials in the validation mechanism. Each time a user logs on to a domain, Windows caches the credentials supplied and stores them in the security hive in the registry of the operation system. With cached credentials, the user can log on to a domain member without being connected to a domain controller within that domain. For more information about cached credentials, see the Cached and Stored Credentials Technical Overview. It is not always desirable to use one set of credentials for access to different resources. For example, an administrator might want to use administrative rather than user credentials when accessing a remote server. Similarly, if a user accesses external resources, such as a bank account, he or she can only use credentials that are different than their domain credentials. The following sections describe the differences in credential management between current versions of Windows operating systems and the Windows Vista and Windows XP operating systems. The Remote Desktop Protocol (RDP) manages the credentials of the user who connects to a remote computer by using the Remote Desktop Client, which was introduced in Windows 8. The credentials in plaintext form are sent to the target host where the host attempts to perform the authentication process, and, if successful, connects the user to allowed resources. RDP does not store the credentials on the client, but the user’s domain credentials are stored in the LSASS. Introduced in Windows Server 2012 R2 and Windows 8.1, Restricted Admin mode provides additional security to remote logon scenarios. This mode of Remote Desktop causes the client application to perform a network logon challenge-response with the NT one-way function (NTOWF) or use a Kerberos service ticket when authenticating to the remote host. After the administrator is authenticated, the administrator does not have the respective account credentials in LSASS because they were not supplied to the remote host. Instead, the administrator has the computer account credentials for the session. Administrator credentials are not supplied to the remote host, so actions are performed as the computer account. Resources are also limited to the computer account, and the administrator cannot access resources with his own account. When a user signs in on a Windows 8.1 device, LSA saves the user credentials in encrypted memory that are accessible only by LSASS.exe. When Windows Update initiates an automatic restart without user presence, these credentials are used to configure Autologon for the user. On restart, the user is automatically signed in via the Autologon mechanism, and then the computer is additionally locked to protect the user’s session. The locking is initiated through Winlogon whereas the credential management is done by LSA. By automatically signing in and locking the user's session on the console, the user’s lock screen applications is restarted and available. For more information about ARSO, see Winlogon Automatic Restart Sign-On (ARSO). In Windows Server 2008, Windows Server 2003, Windows Vista, and Windows XP, Stored User Names and Passwords in Control Panel simplifies the management and use of multiple sets of logon credentials, including X.509 certificates used with smart cards and Windows Live credentials (now called Microsoft account). The credentials—part of the user’s profile—are stored until needed. This action can increase security on a per-resource basis by ensuring that if one password is compromised, it does not compromise all security. After a user logs on and attempts to access additional password-protected resources, such as a share on a server, and if the user’s default logon credentials are not sufficient to gain access, Stored User Names and Passwords is queried. If alternate credentials with the correct logon information have been saved in Stored User Names and Passwords, these credentials are used to gain access. Otherwise, the user is prompted to supply new credentials, which can then be saved for reuse, either later in the logon session or during a subsequent session. If Stored User Names and Passwords contains invalid or incorrect credentials for a specific resource, access to the resource is denied, and the Stored User Names and Passwords dialog box does not appear. Stored User Names and Passwords stores credentials only for NTLM, Kerberos protocol, Microsoft account (formerly Windows Live ID), and Secure Sockets Layer (SSL) authentication. Some versions of Internet Explorer maintain their own cache for basic authentication. These credentials become an encrypted part of a user’s local profile in the \Documents and Settings\Username\Application Data\Microsoft\Credentials directory. As a result, these credentials can roam with the user if the user’s network policy supports Roaming User Profiles. However, if the user has copies of Stored User Names and Passwords on two different computers and changes the credentials that are associated with the resource on one of these computers, the change is not propagated to Stored User Names and Passwords on the second computer. For more information about Stored User Names and Passwords, see the Cached and Stored Credentials Technical Overview. Credential Manager was introduced in Windows Server 2008 R2 and Windows 7 as a Control Panel feature to store and manage user names and passwords. Credential Manager lets users store credentials relevant to other systems and websites in the secure Windows Vault. Some versions of Internet Explorer use this feature for authentication to websites. Credential management by using Credential Manager is controlled by the user on the local computer. Users can save and store credentials from supported browsers and Windows applications to make it convenient when they need to sign in to these resources. Credentials are saved in special encrypted folders on the computer under the user’s profile. Applications that support this feature (through the use of the Credential Manager APIs), such as web browsers and apps, can present the correct credentials to other computers and websites during the logon process. When a website, an application, or another computer requests authentication through NTLM or the Kerberos protocol, a dialog box appears in which you select the Update Default Credentials or Save Password check box. This dialog box that lets a user save credentials locally is generated by an application that supports the Credential Manager APIs. If the user selects the Save Password check box, Credential Manager keeps track of the user's user name, password, and related information for the authentication service that is in use. The next time the service is used, Credential Manager automatically supplies the credential that is stored in the Windows Vault. If it is not accepted, the user is prompted for the correct access information. If access is granted with the new credentials, Credential Manager overwrites the previous credential with the new one and then stores the new credential in the Windows Vault. The Security Accounts Manager (SAM) is a database that stores local user accounts and groups. It is present in every Windows operating system; however, when a computer is joined to a domain, Active Directory manages domain accounts in Active Directory domains. For example, client computers running a Windows operating system participate in a network domain by communicating with a domain controller even when no human user is logged on. To initiate communications, the computer must have an active account in the domain. Before accepting communications from the computer, the LSA on the domain controller authenticates the computer’s identity and then constructs the computer’s security context just as it does for a human security principal. This security context defines the identity and capabilities of a user or service on a particular computer or a user, service, or computer on a network. For example, the access token contained within the security context defines the resources (such as a file share or printer) that can be accessed and the actions (such as Read, Write, or Modify) that can be performed by that principal—a user, computer, or service on that resource. The security context of a user or computer can vary from one computer to another, such as when a user logs on to a server or a workstation other than the user’s own primary workstation. It can also vary from one session to another, such as when an administrator modifies the user’s rights and permissions. In addition, the security context is usually different when a user or computer is operating on a stand-alone basis, in a network, or as part of an Active Directory domain. When a trust exists between two domains, the authentication mechanisms for each domain rely on the validity of the authentications coming from the other domain. Trusts help to provide controlled access to shared resources in a resource domain (the trusting domain) by verifying that incoming authentication requests come from a trusted authority (the trusted domain). In this way, trusts act as bridges that let only validated authentication requests travel between domains. How a specific trust passes authentication requests depends on how it is configured. Trust relationships can be one-way, by providing access from the trusted domain to resources in the trusting domain, or two-way, by providing access from each domain to resources in the other domain. Trusts are also either nontransitive, in which case a trust exists only between the two trust partner domains, or transitive, in which case a trust automatically extends to any other domains that either of the partners trusts. For information about domain and forest trust relationships regarding authentication, see Delegated Authentication and Trust Relationships. A public key infrastructure (PKI) is the combination of software, encryption technologies, processes, and services that enable an organization to secure its communications and business transactions. The ability of a PKI to secure communications and business transactions is based on the exchange of digital certificates between authenticated users and trusted resources. A digital certificate is an electronic document that contains information about the entity it belongs to, the entity it was issued by, a unique serial number or some other unique identification, issuance and expiration dates, and a digital fingerprint. Authentication is the process of determining if a remote host can be trusted. To establish its trustworthiness, the remote host must provide an acceptable authentication certificate. Remote hosts establish their trustworthiness by obtaining a certificate from a certification authority (CA). The CA can, in turn, have certification from a higher authority, which creates a chain of trust. To determine whether a certificate is trustworthy, an application must determine the identity of the root CA, and then determine if it is trustworthy. Similarly, the remote host or local computer must determine if the certificate presented by the user or application is authentic. The certificate presented by the user through the LSA and SSPI is evaluated for authenticity on the local computer for local logon, on the network, or on the domain through the certificate stores in Active Directory. To produce a certificate, authentication data passes through hash algorithms, such as Secure Hash Algorithm 1 (SHA1), to produce a message digest. The message digest is then digitally signed by using the sender’s private key to prove that the message digest was produced by the sender. SHA1 is the default in Windows 7 and Windows Vista, but was changed to SHA2 in Windows 8. Smart card technology is an example of certificate-based authentication. Logging on to a network with a smart card provides a strong form of authentication because it uses cryptography-based identification and proof of possession when authenticating a user to a domain. Active Directory Certificate Services (AD CS) provides the cryptographic-based identification through the issuance of a logon certificate for each smart card. For information about smart card authentication, see the Windows Smart Card Technical Reference. Virtual smart card technology was introduced in Windows 8. It stores the smart card’s certificate in the PC, and then protects it by using the device’s tamper-proof Trusted Platform Module (TPM) security chip. In this way, the PC actually becomes the smart card which must receive the user’s PIN in order to be authenticated. For more information about virtual smart cards, see Virtual Smart Card Overview. Remote and wireless network authentication is another technology that uses certificates for authentication. The Internet Authentication Service (IAS) and virtual private network servers use Extensible Authentication Protocol-Transport Level Security (EAP-TLS), Protected Extensible Authentication Protocol (PEAP), or Internet Protocol security (IPsec) to perform certificate-based authentication for many types of network access, including virtual private network (VPN) and wireless connections. For information about certificate-based authentication in networking, see Network access authentication and certificates.